Due to two long ocean passages and three different countries, we’ve split this years write-up into two sections. This was without doubt going to be a tough year for us. 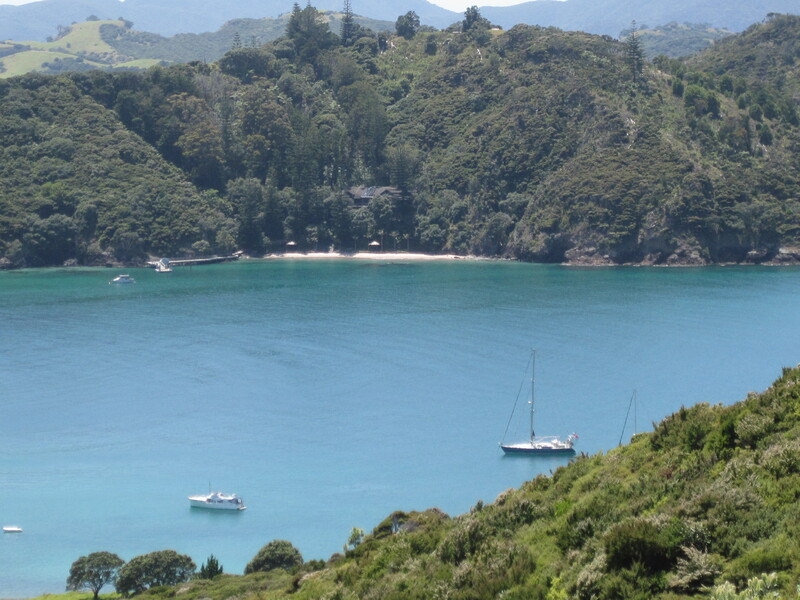 We’d applied for a six months extension to the normal twelve months allowed by New Zealand Customs for foreign vessels and the final deadline was fast approaching in May. So we had to leave or face stringent import duties. But we had plenty of choices; either returning the way we’d arrived, back to Australia across the Tasman sea – or directly northwards to New Caledonia, Tonga and Fiji… or we could make the really long voyage heading northeast to Tahiti, a distance of nearly three thousand miles once the prevailing winds were taken into account. Jill & Robert onboard Fat Annie faced the same dilemma but they’d already arrived from Fiji and Tonga via New Caledonia, whereas we’d arrived in New Zealand from Australia. We were very good friends since the Mediterranean and we were all four of so pleased to meet up once again in the North Island’s Whangarei. 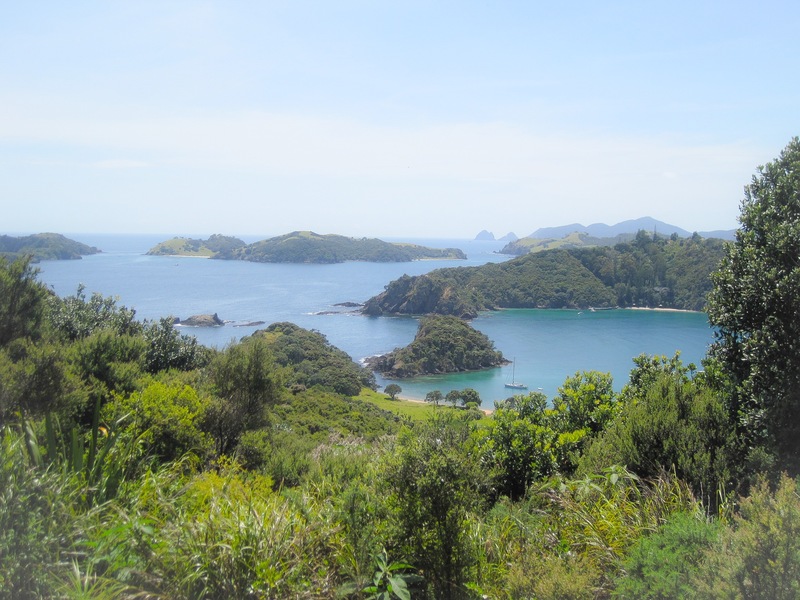 Whangarei proved to be a real good place. Excellent yacht maintenance facilities attracted numerous foreign yachts (no motor cruisers here) and we’d begun to encounter many Canadian and American vessels who’d crossed the Pacific with tantalising reports of British Columbia and Alaska… absolute paradise for sailing apparently. We spent our time in Riverside Boatyard and had a fine time there; a boating community consisting of many nationalities and a good social experience. Yet again we made many friends. We were also pleased to see Dave’s step-brother Gary and meet his outgoing partner Shirley who proved to be very popular in the boat-yard as time passed by… they were visiting from England and happened to be passing through Whangerei whilst Sänna was moored up in Riverside. Like Jill & Robert we’d already sailed many of the exotic destinations these foreign boats were heading for because we were heading eastwards, whereas these guys were going the opposite way, to the north-west; so we four talked and talked during many wonderful evenings and decided that we two English yachts would head for British Columbia in Canada and from there to Alaska. But to complete this nine thousand mile voyage we’d first have to head for Tahiti in French Polynesia and then to Hawaii. This was our plan. We can only follow the winds and the prevailing trade wind in the Pacific is from an easterly direction… which is why almost all sailing yachts cruising around-the-world enter the Pacific through the Panama Canal and then sail downwind all the way across. 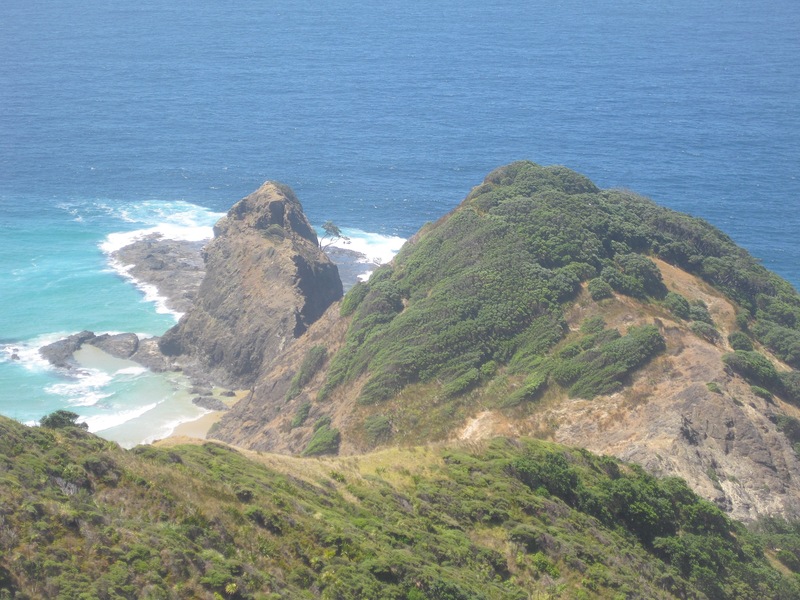 Easy stuff really… and then they get blasted by the infamous storm systems around New Zealand. Like Fat Annie, Sänna was making her way around in the opposite direction so, if we wished to cross the Pacific, we had little choice but to sail northwards across the prevailing winds . Of course, not only would we cross from west to east but also south to north, from one hemisphere to the other. Choices eh? As well as needing to watch the prevailing easterlies we would also be sailing straight into one of the world’s extreme hurricane zones, or cyclones as they are referred to in the Pacific south. But the southern winter begins in May and the cyclone season diminishes, although not entirely; and north of the equator, heading for Hawaii, the hurricanes are reaching their height. So both Fat Annie and ourselves wisely decided to engage the weather routing services of the renowned Bob McDavitt, a living legend with New Zealand sailors. McDavitt would route us around any bad weather and warn us of approaching cyclones. Well, it didn’t quite work out like that. 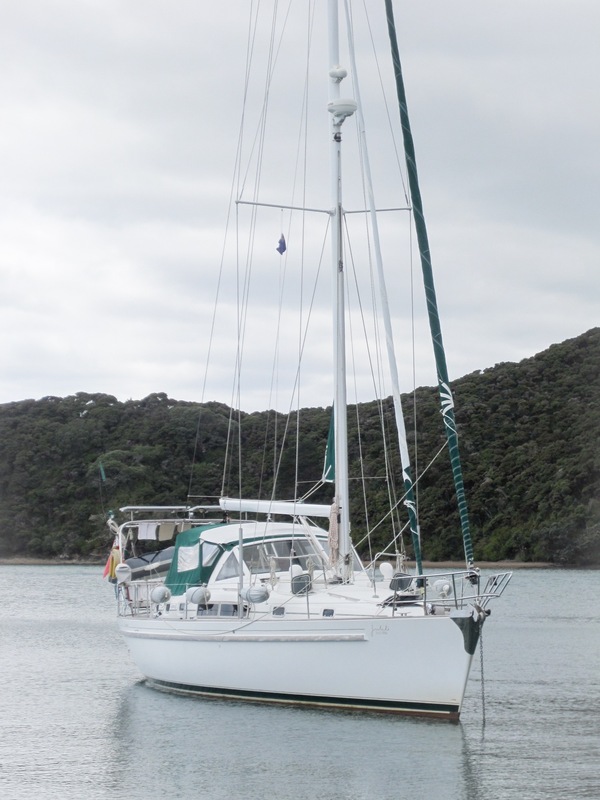 We left Whangarei on the tide within an hour of Fat Annie but soon became somewhat distant friends; it’s no easy matter staying in contact with other sail-boats. Almost immediately we had to contemplate returning to harbour to fix a broken water supply pipe onboard which pumped all of our recently topped up freshwater supply into the bilges. But we managed to fix it between the two of us whilst being tossed around in a tough sea and we replenished our water-tanks with our onboard watermaker. Luckily, we were able to continue north-east regardless on a direct rumb line course for Tahiti. The first six days out were fine. On McDavitt’s advice we’d taken the decision to make a direct course rather than the usual route of heading around a thousand miles directly east on the back of prevailing westerlies from New Zealand and then making a gradual turn north for French Polynesia as the winds slowly backed to blow from the south-east and then more easterly. 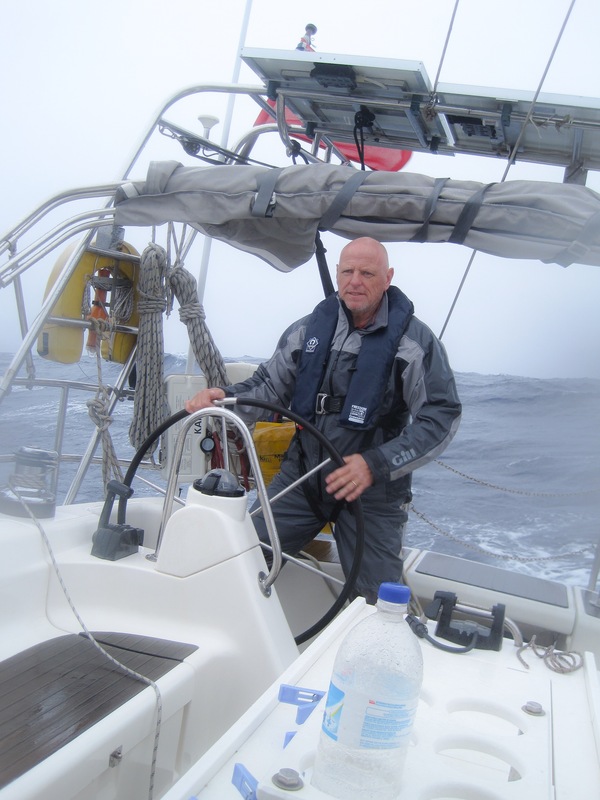 McDavitt informed us that, nowadays, changing weather patterns gave more options and his somewhat novel plan certainly saved us many miles… we’d never used long distance weather routing services before or ever sailed in companion with another yacht. Then, seven days out, we received an alarming communication from McDavitt warning us of an approaching storm which, he said, could deteriorate further and become quite violent. A Low Pressure system was developing south of Fiji and moving south east right across our intended course. “Turn directly north,” he advised. We would then avoid the very worst as the storm system passed in front of us and we could use the westerlies to the north of the storm to take us to Tahiti. So both ourselves and Fat Annie, by now forty miles east of us, turned north. Yes we avoided the worst… and the worst was bad, but we still endured a two day full-on gale with enormous seas. 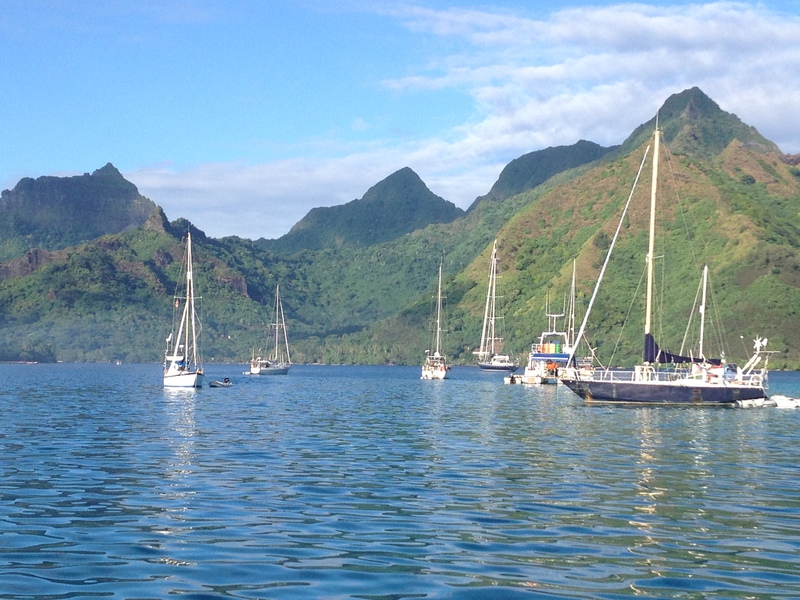 West of us, a couple of days behind, we heard from Gypsy Blue that they were returning to New Zealand with a broken boom and later, when in Tahiti, we learned of the sad and tragic loss of the American sailing yacht Nina with all seven hands. McDavitt also told us that another yacht he’d been routing had pitch-polled in forty foot seas south of Fiji and had been badly damaged. That’s how bad this storm system was. Our next problem was there were no westerly winds to be found north of the storm as it passed on southwards. They’d died away. Now both vessels were stranded eleven hundred miles from Tahiti and, once the normal easterly trades returned to blow – which they would – we’d be sailing directly into wind. And now we had a windless High developing right in front of us. We had no choice but to turn on the engine and for the next five days we motored in windless conditions… using up our valuable fuel reserves. Sänna’s fuel capacity isn’t large… we’re a sailing vessel after all. Fuel became a real issue. Rather than face the prospect of running out of diesel before reaching Tahiti and then being faced with no wind or north easterlies directly on our nose, we decided we could turn north-west to reach the Cook Islands to refuel there. But that would mean giving up Tahiti and French Polynesia… and then, of course, not being able to make Hawaii and Canada. So our whole plan would change. You see why we never make plans we can rely on? In any event, Fat Annie informed us over the radio they had reserves they could spare and McDavitt also advised us that forecasted winds forming the other side of the High would get us to Tahiti… just. First we would need to continue forlornly motoring on, on engine through the centre of the High and hope McDavitt was right. Fortunately, he was. We rendezvoused with Fat Annie who were ninety miles away from us by now. We converged our courses overnight and, as a glorious sun arose in the Pacific east in an absolutely magical sunrise, both vessels found each other on the horizon. Two small English yachts five hundred miles from any land or other vessel. It was yet another magnificent meeting of four friends. Robert had already loaded jerry cans of diesel into his small dinghy and he motored them across to us – in calm seas five thousand metres deep according to our charts. Robert also bought a gift of chocolate biscuits and we gave him a hurriedly made thank-you card. Once we found McDavitt’s predicted easterly winds, with just a hint of south in them, we were able to sail hard on the wind for Tahiti. Luckily the winds veered more south-easterly as we progressed and the last three hundred miles were fast, easy beam reach sailing right through the gap in the reef and into Papeete, capital of Tahiti. Fat Annie had arrived the night previously having taken a more direct course and were there waiting to greet us. We’d made the near two thousand eight hundred mile crossing in twenty one days.